On 1 January 2016 a fundamental reform in insurance supervision law entered into force with the introduction of Solvency II. In particular the own funds requirements (solvency regulations) for insurance and reinsurance undertakings are affected. The previously existing static system for the determining of own funds requirements was replaced by a risk-based system. Qualitative elements, such as, for example, internal risk management are required to be afforded stronger consideration. Under the new supervisory regime, it is intended to achieve greater harmonisation of supervision in Europe. To extend the existing system that was hitherto predominantly quantitative in nature by adding qualitative requirements: Since there is a relatively broad room for manoeuvre available to insurance and reinsurance undertakings with regard to the formation of their risk profile in the solvency capital requirement (pillar 1), it should be ensured in contrast, that the qualitative requirements for controlling the undertaking, the governance system, and internal processes etc. (pillar 2) are more intensively reviewed by the supervisory authority. Strengthening of a risk-oriented supervision: The supervisory authority’s focus is intended to concentrate on the areas where there is the greatest risk potential; the supervisory means deployed should be proportionate to the extent at which the supervisory aims are placed in jeopardy. Increasing transparency and accountability: The far-reaching disclosure obligations (pillar 3) benefit the comparability of the financial situation, solvency and the governance system of the individual insurance and reinsurance undertakings. Undertakings that apply model procedures or which have a risk-aware corporate governance, should be “rewarded” for this (at least that is the idea) by the addressees of the disclosure (i.e. the policyholders, insurance intermediaries, ratings agencies, investors and other market participants). 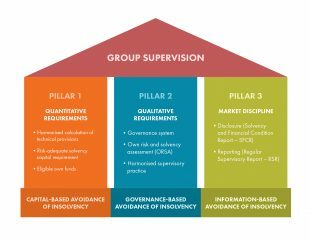 More efficient monitoring of insurance groups: By extending the tasks conferred on colleges of supervisors and strengthening the role of the supervisory authority for group-level supervision, it is intended to ensure that group-wide risks are not overlooked. Aligning the new supervisory regime to international standards: The standards under supervisory law for valuation should as far as possible be harmonised with the international developments in accounting standards (International Accounting Standards (IAS))/(International Financial Reporting Standards (IFRS)), in order to ensure that the administrative burden for insurance undertakings and reinsurance undertakings is kept to a sensible level. Furthermore, the standards developed by the International Association of Insurance Supervisors (IAIS) and the developments in the field of actuarial mathematics have also been taken into account. The Solvency Capital Requirement is either calculated by using a prescribed standard formula or by means of an internal (partial) model developed by the insurance and reinsurance undertaking. The minimum capital requirement forms a lower limit, which if underrun would trigger an intervention by the supervisory authority. The first pillar also includes the regulations for drawing up a solvency balance sheet, which is generally based on market values. The eligible capital is derived on the basis of this balance sheet. Guidelines and contingency plans must be drawn up and standards relating to the internal control system and the issue of outsourcing must be adhered to. Within risk management an Own Risk and Solvency Assessment must be carried out. This includes undertaking forward-looking risk self-assessment. Under Solvency II investments are required to be managed in accordance with the prudent person principle – legal standards for quantitative limits no longer exist. Pillar 2 also covers requirements for the principles and methods of supervision. Particular attention is paid to the Supervisory Review Process. The third pillar of Solvency II contains disclosure and reporting obligations. The Solvency II reports that undertakings are required to submit to the FMA have to a large extent been formalised, both with regard to the contents of the report as well as the reporting format. The new comprehensive disclosure obligations are intended to increase transparency, by increasing the degree of comparability of information, reducing information asymmetries and by improving the information options for interested parties. Consequently corrective effects can be seen in the market, while the introduction of “good practices” is also being promoted. The FMA is also required to meet comprehensive supervisory disclosure obligations on its website and to fulfil reporting obligations. Work has been ongoing since the 1990s on improving (Solvency I) and restructuring (Solvency II) the EU solvency regulations. In a first step the most necessary changes were made to the directives that existed at that time (Solvency I). These rules were in force in Austria from 1 January 2004 until 31 December 2015. Preparations for risk-based insurance supervision under (“Solvency II“) were underway at European level for several years. This page contains an overview of the milestones. Since the 1990s, the then Conference of European Supervisory Authorities worked on the improvement (Solvency I) and restructuring (Solvency II) of the EU regulations on solvency that had been introduced in 1973 for non-life assurance and in 1979 for life assurance undertakings. The Conference of European Supervisory Authorities’ Solvency I working group was established in 1994 under the chairmanship of the then Vice-President of the German Federal Insurance Supervisory Office, Helmut Müller, and published its concluding report in 1997, in which it was stated that the European solvency Directives had on the whole proven themselves. The report, however, also stated that the own funds regulations in place at the time did not adequately take all risks into account. It was therefore decided in 1997 to design a comprehensive system to create new own funds regulations. In a first step the most necessary changes were made to the existing Directives (Solvency I). These rules entered into force on 1 January 2004 in Austria. The overhauling of the entire system was intended to only occur in a second stage. All such endeavours have been addressed by the keyword “Solvency II”. The aim was to create a new European supervisory regime, which would equip the supervisory authorities with suitable qualitative and quantitative tools to be able to allow them to assess the overall solvency of an insurance undertaking in an adequate manner. The previously applicable static system for determining the own funds base was to be replaced by a risk-based system – which also took into account qualitative elements. In July 2001, the Committee of European Insurance and Occupational Pensions Supervisors (CEIOPS, subsequently EIOPA) set up a working group with the aim of allowing national supervisory authorities to contribute towards the “Solvency II” project. The group investigated historic developments, reasons for the failure of insurance undertaking, as well as new trends with regard to the risk analysis of insurance undertakings. On the basis of the findings of the aforementioned studies and other studies (by EU working groups, IAA – International Association of Actuaries, IAIS – International Association of Insurance Supervisors, and the KPMG study) it was decided to adopted a three pillar approach for Solvency II, similar to the design of Basel II but adapted to take into account various specificities of the insurance industry. Changing from a rule-based system to a principle-based system (e.g. removing of strict rules, replaced by more flexible possibilities for intervention and more qualitative requirements). In order to offer Austrian insurance undertakings an opportunity to perform a self-assessment in relation to Solvency II, the FMA conducted a Self-Assessment in 2011. Furthermore sample contracts for life assurance and health insurance in accordance with Solvency II were evaluated and compared with current provisions. Undertakings that plan to use an internal model, were required to fill out an extended questionnaire. The excel file contains several worksheets that have been broken down thematically, with the assessment of the status of implementation of a Solvency II requirement being entered in the cells highlighted in yellow. It is important to note that the current status of implementation was asked for (cut-off point: 30 June 2011). It was therefore assessed to what extent the requirements in accordance with Solvency II had already been implemented. The last two worksheets (with red tabs) were only to be filled out by those undertakings, that were planning to implement and internal full or partial model. The self-assessment was intended to reflect the current implementation status as precisely and comprehensibly. Five issues, that are specified in the questionnaire, were to be described in greater detail in this Word document. The FMA’s aim was to receive comparison values for three sample contracts. Every insurance undertaking was therefore requested to choose a contract from their portfolio, which as far as possible corresponded to the sample supplied. In the event that the undertaking did not have a “similar” insurance contract, then an existing contract was to be adapted in such a way that it matched the respective sample contract as far as possible. In this case the same principle applies as that mentioned for Life Assurance.